Anjunadeep’s recent releases have picked up support on BBC Radio 1 from Zane Lowe, Pete Tong and Annie Mac, as well as Sasha, Eats Everything, Gorgon City, Tensnake, Damian Lazarus, Henrik Schwarz, Todd Edwards, Disclosure and Larry Heard, amongst many others. Now, the sixth installment of this series sees Anjunadeep showcase the label’s sound across two discs of ambient electronica, melodic deep house, upfront garage and spacey techno. 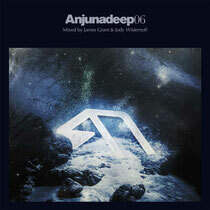 For the first time, both CDs are mixed not by one artist apiece, but by both James Grant and Jody Wisternoff as a duo, allowing for a true journey through the Anjunadeep sound. Label boss James Grant has built a following over the years, whilst Bristol’s Jody Wisternoff, one half of act Way Out West, has a reputation as a true crate digger and talent spotter. The first part of the double mix kicks off with a piece of electronica from label favourite Croquet Club, before burning slowly through exclusive original material from John Monkman, Vincenzo, Steve Huerta and Lane 8, before closing with new exclusives from label legends Dusky, Martin Roth and 16 Bit Lolitas. Also featured are melodic moments from rising stars Cubicolor and Journeyman. Part 2 of the compilation moves further towards the dancefloor, with a collaborative remix of Choir Of Young Believers from Lane 8, James Grant and Jody Wisternoff setting the tone early on, followed by garage tinged contributions from Eli & Fur and Dave Angel. Label regulars Beckwith, Lancelot and Meramek bring some bass heavy flavour, whilst label newcomers Shur-i-kan, Ashworth and Shingo Nakamura deftly blend darker, techno atmospherics. The mix drives to a climactic finish, through the emotive techno of Universal Solution’s ‘Bandur’ and Leftwing & Kody’s progressive throwback ‘Tell Me’, before ending with a track from composer Olafur Arnald, remixed by Ryan Davis. It’s out 8 September, check the mini mix out below.